Today I feel good. No DOMS which is great. Still some soreness from sunburn on my back and chafing on the back of my neck from the wet suit. But everything else is a-ok. Still not sleeping great. I’m putting it down to not being in my own bed. Today I probably walked about 6-7km in total. Tomorrow I plan on doing the coastal walk which is about 14.2km return. After lunch at the Sea Acres Rainforest Centre we did the 1.3km elevated rainforest boardwalk. Then we headed over to historic Roto House, built in 1891 and restored in the 1980’s. 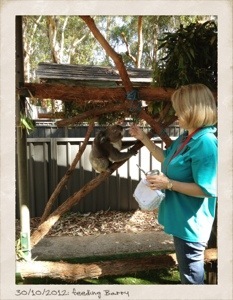 We then visited the Koala Hospital for the talk and tour. They receive no finding from the state or federal governments, relying solely on volunteers and donations from the public. They get quite a few injured koalas at this time of year because its mating season so male koalas are on the move, getting hit by cars or injured in dog attacks. Then there are koalas infected with chlamydia that need to be treated with antibiotics. One koala that stole my heart was an elderly male called Barry who has scoliosis and kyphosis of the spine. He’s about 12 years old (the average life span of a male is 15 years). He is a permanent resident at the hospital. Yeah I’m feeling surprisingly good. Amazing what the body can cope with!